I don’t know when was the last time we visited him. It was that long. It almost felt like we’re being irresponsible or worse, forgetful. 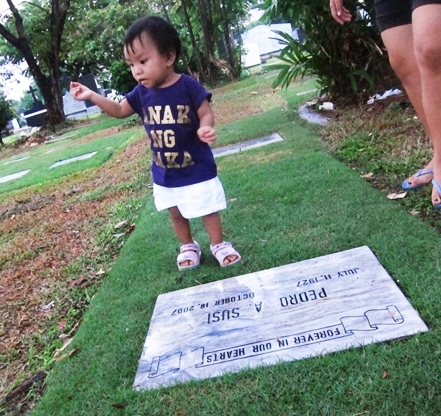 But Bianca was insistent that day to visit Lolo, rain or shine. For a while, the sun was really out. It was high, and hot, and everything was drier than paper. We waited for the sun to be less angry, but it was soon blanketed with dark clouds. On our way there, it started raining, and hearts were slowly feeling defeated. To be honest, it almost felt like Lolo has been harboring hard feeling for us because we took too long to visit him again. But then, it always rains when it’s about him. On his funeral, it rained. After two years of regular visiting, it started raining each time we planned to go. Bianca proved to be the smartest of us all when she said Lolo is just testing us if we’ll still go in spite of the rain. So we went. And our littlest lady finally got her feet slightly damp by the small patch of grass covering the most loving man we’ve ever met. In spite of the legs in that corner, I think this is a fantastic introductory photo.